When it comes to cleaning in the spring, give it enough time and decide in advance what you want to clean. Worth to write a list. With systematic spring cleaning you save precious time. Ideally, you should focus on one room at a time. As a rule, things are removed from top to bottom in the following order: first remove dust from all surfaces, such as cabinets, tables, window sills and plants. The second step is to clean the upholstery and furniture. The floor is being removed at the end. We all have a basic cleaning list, but how many places do we remember? You know, the ones we avoid by sight, pretending that we do not see dust cats. Hide warm winter things. Get ready for spring, summer. You will refresh your wardrobe and you will probably find a few forgotten summer pearls. Remove the shelf from the dust, put the fragrance bag on one of the shelves – thanks to that you will feel the spring every time you open the wardrobe! It does not matter if you cook a little or a lot. The sludge and dust settle on cabinets at the rate of lightning. It’s worth to vacuum them off from time to time. The interiors of the cabinets hide many delicious treasures. Take a look at whether your carefully stocked supplies are still useful to eat. If not, throw them away. Make room for new ones. How cool it is to be able to look at the windows shining in the sun. Washing will not take you much time, and the effect will definitely be worth the work done. Do not forget about washing curtains and curtains. They are dust absorbers. After washing, the whole flat will smell nice and fresh. This is not the place we remember. However, it is a vault of dust, hair elastics, earrings and socks. Do you sleep well, aware of the additional “mattress” growing under your bed? That is why it is worth to lift the bed once in a while, thoroughly vacuum and wash the floor. And the joy of finding things in the bonus. Wash or bring decorative cushions, plaids or rugs to the laundry room. Especially with pets, these things get dirty much faster. They catch fur. Refreshed, ironed will be pleasing to the eye. People do not love to clean the fridge, but you have to do it regularly. In the end, we store food in it. Check that jams, mustard and ketchup have a good expiration date. Delete what is old. Make room for fresh tomatoes, fresh vegetables and fruits. How many times in a hurry did you have to drill or screw something and then put the equipment carelessly into the box. Sort tools, nails and other accessories. Maybe, by the way, you’ll find inspiration for small patches at home? Baking soda is one of the natural substances commonly used in the household. It has many uses at home – we chose the 8 most interesting. Baking soda is good for cleaning, removing scale from the kettle or microwave or grout stains. You can buy baking soda easily in the store, because it is a popular product often used for baking. But baking soda has many other uses at home: kitchen, cosmetics, health care and cleaning. Soda is great for cleaning many home appliances. Here are some ideas for using baking soda at home. You do not have to buy ready-made chemicals to effectively clean! Soda will help us maintain cleanliness and speed up the preparation of meat dishes, cooking peas and beans. We can use it to clean the microwave oven, thanks to it we will get rid of the unpleasant odor from the refrigerator and remove the stone deposit. Baking soda can be used instead of baking powder, it is also perfect for cooking cauliflower. If you are bothered by the unpleasant odor of this vegetable, necessarily add a pinch of soda to the cooking water. Soda perfectly kills bad smells! Thanks to it, in a few moments we will get rid of the irritating smell of garlic or fish. All we need is to rub our hands with soda. Guide for 8 applications of baking soda! The microwave oven, when it is rarely washed, is covered with a layer of greasy dirt. To clean the microwave oven, simply wipe the walls with a damp sponge, to which we will pour out some baking soda. The next steps are wiping the inside of the oven with a damp cloth and finally dry. Dust settles on the floors. It is easy to remove it from ceramic tiles using a regular mop, worse with fugues. The reliable baking soda will help here. For cleaning tiles and grouts, we use water with a diluted spoon of baking soda and soap petals. After cleaning, wipe the glaze with a dry cloth. Baking soda will also protect our white things so that they do not gray during washing. Just add half a glass of baking soda to each wash.
Yellow patches of sweat from a blouse or shirt will help to remove the mixture of baking soda with hydrogen peroxide and ordinary water – mixed in equal amounts and applied directly to the stain. The mix needs to be lightly rubbed into the stain with a brush and left to absorb, and then wash your clothes. The burnt iron foot can be cleaned with a mixture of baking soda and vinegar. A slightly heated iron (so that it could be touched by hand) should be wiped with a cloth soaked in a mixture of vinegar and baking soda. 6. How to remove the stone from the kettle using soda? Sludge and stone from the kettle will effectively remove baking soda. Pour the contents of the baking soda package into the kettle, pour over water and bring to the boil. Then mix the whole vigorously and pour out. Repeat this step until all the stone from the kettle has been removed. At the end, scrub the kettle with a hard brush and dishwashing liquid. 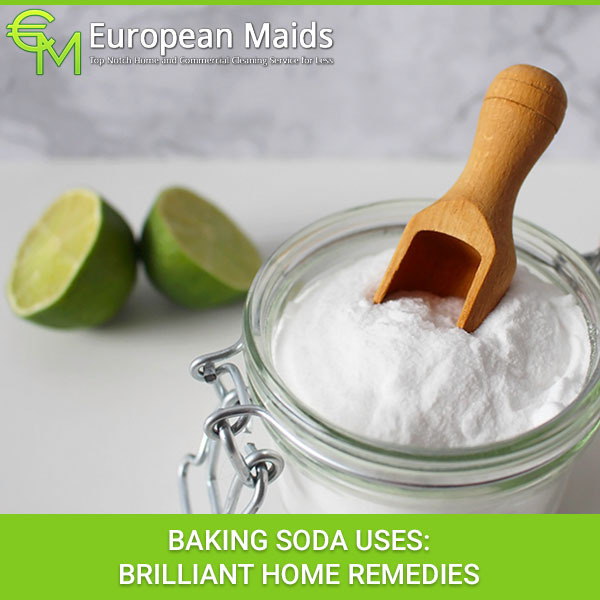 An odor from sweaty, moistened shoes will help to remove baking soda. Put about half a bag of baking soda in your shoes, ideally do it overnight. Leave your shoes like that and in the morning soda shake thoroughly. After the unpleasant smell, there should be no trace! You will remove the unpleasant odor in the trash after wiping the washed trash can with a sponge dipped in a soda solution. Also, soda inserted in the fridge will let you get rid of the unpleasant odor. Clogged sewage pipes clear baking soda mixed with vinegar. Mix half a glass of soda with a glass of vinegar and pour into the drain. When the mixture stops hissing, pour 2 liters of hot water there. A white sofa can fit into any interior, such furniture will always look winning and stylish. It is not always possible to keep the snow-white upholstery for a long time, light fabrics much more often need cleaning and care. It is possible to clean the sofa not only with the help of specialized companies, spots can be removed and in the home, you just need to know how to do it right. Specialized household chemistry will allow faster and easier to remove spots on a light cloth at home, but such costs are more expensive and, if used improperly, can be dangerous to health. Homemade recipes are safe and economical, but require patience and excellence from the hostess. Also, it is necessary to consider whether it is possible to freely remove the upholstery from the sofa, some models allow you to do it in one hand, just undo the lightning. In this case, the removable material can be put in a dry cleaner or washed at home, following the instructions. Not every sofa can be washed in a washing machine, because of this the material can sit or stretch, and the replacement will cost cheaply. Some experts do not recommend using a vacuum cleaner when cleaning upholstered furniture, as this may disrupt the structure of the filler. However, there is no other way to clean the sofa from dust, so you can use a vacuum cleaner, but neatly. It is best to use a special attachment for upholstered furniture and, if possible, reduce the power of the device. Light, and even more so, white cloths require constant attention. The sooner you detect contamination, the higher the probability to withdraw it without much effort and cost. In addition, it is necessary to conduct a preventive cleaning at least once a month in order to refresh the tint and maintain the upholstery in good condition. No matter which tool you choose to clean the couch at home, you do not have to try to mix several methods together. The desire to achieve more effective influence can lead to damage to the color or the structure of the upholstery, which will have to order a new one. Also, do not use a lot of different tools, if no one helps, in this case, it is better to give the material in dry cleaning. For today it is not difficult to find the necessary means to clean the sofa at home. In this case, you can use as a specialized household chemistry for upholstered furniture, and things for carpets. For light colors you can find individual variants with special instructions on the label. With the help of household remedies it is possible to clear any spots from any surfaces at home, but you must immediately know which method to apply. If you make a mistake, you can get the opposite effect. The white sofa upholstery quickly absorbs any contamination, whether it is street dirt, household spots or the results of long-term exploitation. To get rid of such pollution is necessary immediately, otherwise they will be more and more dress up in the material, in addition to them will be added and new spots. Spills from spilled coffee or tea are especially noticeable on a white upholstery, and since this trouble can happen quite often, you need to know how in this case you can clean the sofa at home. To cope with this problem, you will need only a piece of commercial soap. To begin with, the affected area of ​​the upholstery should be moistened with ordinary water, and then rub the soap to create a light foam. Then a rigid brush should rub the contaminated area and leave the sofa in such a state for 10-15 minutes. After this, remnants of soap should be removed with a sponge soaked in water. It can add a couple of teaspoons of salt, then cleaning will be more productive. Red wine, poured on a white upholstery sofa, can also deliver the mistress a lot of hassle, as to bring such pollution is not easy. It is necessary to act with the help of household remedies as soon as the stain has been formed. Otherwise, it will dry up, and it can be removed only with the help of dry-cleaning or specialized means. First, it is necessary to wet the stain with napkins or paper so that it spreads as little as possible. Then not yet dried spot should be plentifully poured with a layer of salt and leave for 10-15 minutes, so that it drained moisture. After that, the salt is removed with a rigid brush, and the remnants of the stain are displayed with a soft soapy solution. On the white upholstery of the sofa can fall and greasy food, so you need to know in advance what in this case you can clean up the upholstered furniture. As in most cases, it is necessary to act immediately so that the spot does not enter, otherwise it will not be possible to bring home remedies. To remove excess fat, you should brush the stain with salt, soda or starch and leave for 15 minutes. After that, the dry spot is removed using a soap solution and a soft sponge, while it is best to use a dishwashing detergent. For the best effect it is recommended to leave the soap solution on the spot for another 15 minutes, and then rinse with clean water. The worktop in the kitchen is the main work surface, which must always be clean and tidy, so that the look of the room is well-groomed, and the cooking – pleasant and safe. Regardless of whether the surface is made of natural or artificial stone, it is important to learn how to properly care for it in order to avoid damage and traces of use: do not put red-hot and heavy objects, use special boards when cutting, do not wash with products containing chemically aggressive components. Subtleties of care depend on the specific material from which the tabletop is made. The kitchen worktop is often made of artificial stone – acrylic or quartzite, which is distinguished by an aesthetic look, special strength and ease of use and care. A distinctive feature of the surface of artificial material is unpretentious care – dust and dirt can be easily removed with a soft cloth and household cleaners. To give beauty and shine, polishes are applied on a clean surface. The quartzite tabletop is stronger than acrylic, so cracks and chips on it appear much less frequently. However, unpleasant scratches can be avoided on the acrylic surface by polishing: chips are filled with a special solution and polished with a new one. However, such work should be done only by a specialist. In general, the care of artificial stone does not require any additional trouble and effort from the owner. Use soft, creamy cleansers, whose pH is sufficient for a natural stone. Use special pulling paste to remove old and greasy stains from the surface. After each cleaning, handle the tabletop with wax products that create a protective layer on the surface. 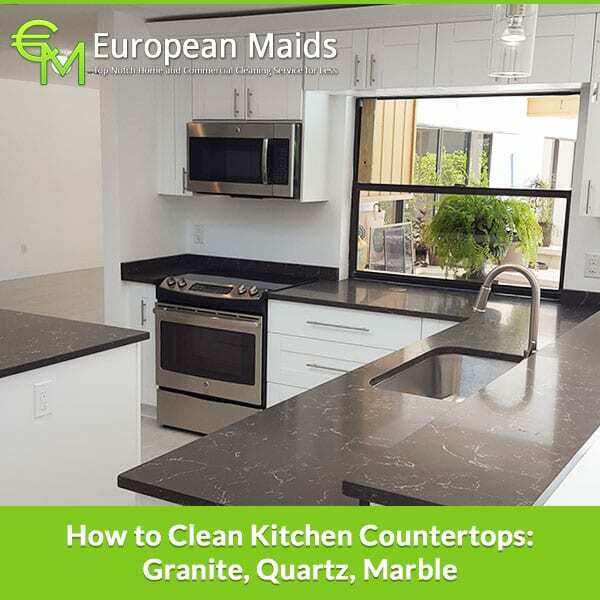 In general, subject to all the rules of care, the countertops are made of natural or artificial stone, the surface will last for a long time even with constant use without visible damage. 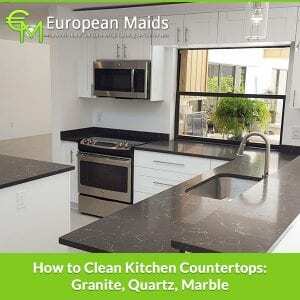 Simple cleaning methods, timely removal of dirt and dust will help to spend less time washing the countertop. 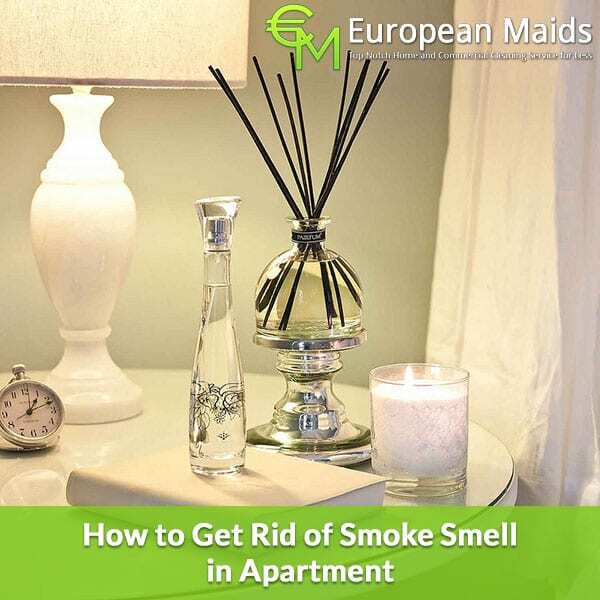 If you are looking for a way to get rid of the smell of tobacco in an apartment, then you can’t escape general cleaning. Textile items of the interior are most absorbed by the tobacco smoke: curtains, carpets, upholstered furniture and toys. All that can be moved into a washing machine, you need to wash thoroughly. Before washing things, it’s best to hang out for some time on the street to remove some smell. Upholstered furniture can be sent to the cleaning, or try to remove stagnant amber on their own. To start, sprinkle the furniture and carpets with baking soda. This substance must remain on the textile surface for at least 18-20 hours. Then you need to remove the soda with a vacuum cleaner. Most likely, a single use of soda can not do and the process will have to repeat several times. After processing with soda, apply a household chemistry for cleaning fleece and textile surfaces. Preferably all special substances based on enzymes, which decompose organic matter into harmless elements. Enzymes work in a humid environment, so after applying the product, it is necessary for some time to close the treated surface with polyethylene or damp cloth. After a few hours the surface should be vacuumed and dried thoroughly. But even the cleaning of ordinary shampoos for carpets and furniture can largely eliminate an unpleasant smell. The main task is to dry things thoroughly. Otherwise, the smell of tobacco in your apartment will soon change the smell of mold. But not only textiles absorbs tobacco smoke. To eliminate unpleasant odors, you need to rub all the surfaces in the house, starting with mirrors and windows, and finishing with the surfaces of furniture, walls and ceiling. For wiping, you can use a solution of vinegar, which helps to eliminate the tobacco amber. True, then you have to properly ventilate the apartment from the smell of vinegar. But it is not as resistant as tobacco smoke, and it is easy to weather up. Glass, plastic, metal, can be treated with a wiper. For the ordering of wooden surfaces, a glass liquid can also be used, but only that which does not contain alcohol. It is better to us especial household chemicals for furniture care. Walls can be wiped with a well repelled cloth dipped in a weakly acid solution of vinegar or soda. Wipe the tension ceiling as recommended by the manufacturer. After cleaning, if the smell still remains, hang out in the apartment a few fluffy towels moistened in the same solution of vinegar. If you are not lazy, you can walk around the rooms, swinging with these towels. Be sure to change filters in the air conditioner. If there is an air humidifier with a cleaning function, start the unit for several days, changing the location of the device. The smell of melted coffee will be absorbed a little, placed in flat saucers around the house. Well absorbs the smell of tobacco, sea salt, which added a little aromatic oil. The best are pine and fir oil, lavender oil and citrus. With the same means you can fill the aroma lamp. Aromatic candles also help eliminate the smell of tobacco. What to do to prevent the smell from appearing. ashes and cigarettebutts should not just be poured into the bin for garbage, but packed in a plastic bag or tightly closed jar. How To Properly Prepare Home For Arrival Of A Newborn Baby? The main focus on cleaning you should do in the room where there will be a newborn baby. However, the kitchen with a hallway and the bathroom with a toilet require no less attention. Usually these places in the house are the most polluted, and you want to protect the baby as much as possible from germs, fungus and bacteria. Washing windows and washing curtains. Dust accumulates on the curtains that can cause allergic reactions in the baby, so you should get rid of it. If possible, wash or dry clean. If for some reason it was not possible to do this, you can walk through them with a steam generator. Dust removal. Here the above-mentioned cyclone vacuum cleaner comes in handy, which does an excellent job of cleaning and is easy to clean, since it has no replaceable bags. It is necessary to vacuum the walls, upholstered furniture, carpets and floors. Using a water dispenser and brushes, clean the radiators. Wipe switches, sockets, lamps, shelves and window sills, all furniture and baseboards with a damp cloth. Drying of carpets, upholstered furniture and mattresses will not be superfluous. It is also necessary to wash the leaves of all house plants. Cleaning the kitchen. Wash the inside and ventilate the refrigerator, clean the kitchen surfaces from grease, and use a disinfectant to clean the garbage can. In the process of cleaning the gas stove it is necessary to check whether the gas is well supplied, whether there is a leak. Wash the bathroom and toilet. Cleaning the bathroom includes cleaning and washing plumbing, tile, and interfacing joints using safe disinfectants. In this case, a steam generator that will help get rid of mold and fungus, will wash away the remnants of chemistry and dirt will help very much. Wet cleaning of floors. This is the final stage of cleaning. Simple objects for the household and high-quality household chemicals will help to optimize and facilitate the process of cleaning. Mop with a mechanical spin, interchangeable nozzles, microfiber cloths for wiping dust and wet cleaning, melamine sponges – significantly speed up the cleaning process and make it much more pleasant. The main rule when choosing household chemicals is that all sprays, gels and liquids should be of high quality, hypoallergenic and non-toxic, so as not to harm the health of the future mother and baby. If you need more aggressive products that can thoroughly clean kitchen cabinets and ovens, baths and tiles from mold and fungus from fat, it is better to use them while your mother and baby are in the hospital. And to carry out cleaning at least 4 days before their return, so that all chemical vapors have time to disappear. With a large amount of homework for a woman in an interesting position it is difficult to cope alone. Therefore, it is necessary to involve assistants in the cleaning process. The cleaning company will cope with cleaning quickly and efficiently at a convenient time for homeowners. The employees of the cleaning company provide a large list of cleaning services with a quality guarantee, use safe certified cleaning products and professional antiseptic preparations. If we started to wash the mirror, we would like to bring the result of work to perfection, so that the mirror was perfectly clean, radiant. Why are there streaks on the mirror? 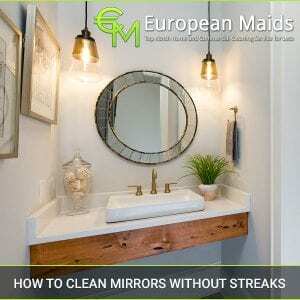 First, streaks occur because the mirror is not well cleaned – there are particles of dust and fat. The second possible reason is the traces of detergent that was used when cleaning the mirror. This results in the appearance of soap streaks. Third, water itself may not be very clean – sometimes it contains various impurities, which are manifested in the form of streaks. Knowing the reasons, it is easy to make an algorithm of action, which will allow to wash the mirror without stains to an ideal shine. For starting with a mirror you need to remove dust and grease. It’s not enough just to spray on a mirror surface a means for cleaning glasses and rub with a cloth – in this case, streaks, most likely, do not pass. Therefore, we arm a sponge and some liquid detergent. Perfectly suitable liquid dishwashing detergent. You can also use shampoo for hair. The sponge needs to be soaked with water, drop a little detergent on it, foam it and carefully rub the mirror (soft side of the sponge!). Under no circumstances should you use any abrasives – they can scratch the surface. Rinse the sponge, remove the detergent from the mirror cloth. Then we take a napkin (it is desirable from microfiber) and another couple of times the mirror is cleared, each time rinse the napkin with clean water. If there are dropped fat droplets on the mirror or other hardened dirt, you can carefully remove them from the surface with a sharp blade or knife, and then rub the area with a soft sponge. If the mirror is very dirty, it is possible to use a dishwashing detergent. It is necessary to first apply it on a sponge and to moisten it, turning it into a paste. Having a paste of consistency, the powder will scratch the surface of the mirror less. Thoroughly removing dirt from the mirror and detergent residue, it is necessary to wipe the surface with the cleanest water. Ideally, it is worth using boiled water, soaking it with a sponge or a napkin. Now you need to rub the mirror to shine. For this purpose it is most convenient to use a microfiber or paper napkin. The paper allows you to perfectly clear the mirror and glass, as, unlike textiles, the paper does not leave a piece of fibers and dust collected on the wet surface. Perfect means are paper towels – they have the optimum softness, absorb excess moisture, while having no property to decompose. Before wiping the mirror to a gloss with a paper cloth or a microfiber napkin, it is necessary to moisten the surface with a means that contributes to the perfect radiance. In stores there is a huge selection of similar means for washing glasses and mirrors. They are sold, as a rule, in large bottles with a spray gun. It is necessary to spray a little money on a mirror and rub it with a paper cloth or microfiber napkin. All! The mirror shines and no streaks! If at hand there is no such means for glasses and mirrors, it is possible to prepare his home analogue. For this purpose, it is necessary to dilute ammoniacal alcohol in boiled water at a rate of 1 tablespoon ammonium per glass of water. Pour this solution into a spray gun, spray on a mirror and wipe it dry with paper or napkin. If there is alcohol or vodka, it is worth adding it to a solution of amber at a rate of 1-2 tablespoons per glass of solution. Products made of gold of the highest standard do not sell, because they are very soft and easily change their shape just under the touch of your fingers. In order to add gold to hardness, make an alloy in which copper, silver or other metals are added. Along with the appearance of rigidity, such gold acquires the propensity to aging, that is, over time it dims, a film of oxide appears on it. The question is how to clean gold, so that its age is not noticeable. It turns out that cleaning can be done easily even at home, you just need to know a few tricks. Imagine ways in a small table, and then describe them in detail, so that everyone can decide how to clean the gold at home with the most suitable means for him. If you are looking for a simple and cheapest way to clean gold at home from dirt, then the use of cloth is for you. You will need a slightly fleecy soft material like fleece. They need to carefully rub the gold to achieve brilliance and purity. This is a mechanical method, very gentle and suitable for absolutely any product. If you clean this way regularly, you will not need to use any liquids, including professional ones. However, this method is not suitable in case of long-standing contamination. With its help you can not get rid of the dark oxide film and it is impossible to clean out the heavily polluted hard-to-reach places. Let’s see how to clean gold at home using detergent and water. There are two options for such cleansing. In the first case, soap or dishwashing gel is dissolved in warm water. In the soap liquid, gold ornaments are placed and left for a couple of hours to make the dirt soft. Take an old toothbrush and clean it every product, then rinse everything in running water and wipe. The second method involves boiling. Soap solution is lowered gold and boiled for 2-3 minutes. Then, all products are pulled out and cleaned in exactly the same way as in the first method, using a soft brush. An uncomplicated way with which you can clear gold from pollution is by boiling it in water with soda. It is necessary to pour a small container of water, put the gold there and heat the water. Then add soda (a glass of water about a tablespoon) and boil for several minutes. When you get your items out of the water, you will have to brush them, rinse them and dry them. Some recommend rubbing gold directly with soda, adding a little vinegar, but this method can lead to surface damage. Soda leaves scratches, and the higher the sample of the product, the more likely that you will mechanically damage your expensive jewelry. Vinegar is also not desirable to clean jewelry. High-grade gold, of course, vinegar is not terrible, but it can damage the alloy. In addition, the acid in no case can not be used if the product contains stones. Even the evaporation of acids can irreparably spoil some minerals. Any toothpaste or tooth powder contains substances with light abrasive properties. So they can clean the metal. Damage to the product will not occur, since the paste contains blowing agents that soften the action of the abrasive. Gold is covered with paste and begins to be cleaned, just like teeth. Only the brush should be taken gently, and do not use it then for the oral cavity. The length of the process depends on how large your product is and how thoroughly you clean it. Gold itself can be wiped with a weak solution of vinegar, ammonia, special cleaning agents. However, stones require special treatment. There are stones that are not afraid of the impact of water and certain chemicals, but there are those that need only an extremely careful approach. Gold product, decorated with diamonds, cubic zirconium, can be cleaned with ammonia or washed in soapy water. Diamonds can even be rubbed with a brush, it does not hurt them. But to turquoise, corals and tender pearls, a solution of ammonia (ammonia) can not be used, it is better to simply wipe the flannel. Ruby, opal, lapis lazuli can be gently washed in a weak solution of baby soap. Many opaque stones in general are best to wipe with a special napkin or soft cloth, without applying to them chemical agents and even water. You can not wet stones if they are glued to gold. Clean the dirt from hard-to-reach places are helped by cotton swabs, which are moistened in a special composition, bought in a jewelry salon. Take care of jewelry regularly and treat them with love. Your safety should be your biggest concern while you are cleaning your house. Numerous incidents of people tripping on wires or slipping on the wet floor have been recorded. Furthermore, most people tend to ignore safety precautions when handling chemical products which might have a negative effect on your health. We also use dangerous equipment such as ladders to clean ceiling fans and vacuum cleaners to make our floors squeaky clean. People who get away with bumps and bruises are lucky. Most people can suffer fracture by not taking proper precaution. Here are some of the guidelines which will protect you when you are making your house look good. Before you start your cleaning process, remove all the items such as toys, shoes, or any other small object from the floor. This way you won’t stumble or pierce yourself from sharp objects while dusting the table. You can also ask your family member to keep their items in a safe place instead of throwing them around all over the house. Ask your kids to put their toys in the place specifically allotted for them. This way you can mop the whole without worrying about stepping on something. Make sure that you don’t mix two different chemical cleaning products together to make a stronger mixture. To remove tough stains use the same product repeatedly instead of mixing it with another one. If you are still not satisfied, wait for the first product to dry before using another one. Mixing two chemical products might destroy your furniture and floor. As a result, your furniture and floors will look like that they have never been cleaned before. Usually, chemical products ask you to wear gloves when you are handling them while others will ask you to open windows or turn on the fan for ventilation. Don’t ignore these instructions. Gloves will protect you from getting skin infections while open windows won’t allow you to suffer from respiratory problems. Also, wear a face mask for the extra precautionary measure. Don’t compromise on your health just because you are too lazy to buy a pair of gloves. Always close the container of chemical products even if you have to utilize it somewhere else. Open containers will allow toxic fumes to escape from the product. Furthermore, you don’t want your kids accidentally spilling the chemicals in your house. Always securely close the bottle. Ensure that all the wires safely tucked under the furniture or beside the wall. No wants to struggle with wires. Your time will be wasted on entangling vacuum cleaners cords from the charger. Moreover, there is a risk of you getting seriously injured by tripping on wires. Always ensure that wires are out of sight when you start mopping the floors. People who are too busy to clean their house should hire a professional cleaning service. These company will hire only those individuals who know how to take care of your home. They know how to leave your home dirt-free. Whether it is coffee stains on a wood table or stubborn dust particles hidden in the carpet, they know how to handle every situation. To fight with dirt, we are taking help from our enemy. Indoor air is known to be two to five times more pollutant than outdoor environment due to excessive use for chemical products. These products contain allergens, hormone disruptors, carcinogens and other harmful chemicals. These substances might be responsible for headaches, rashes, allergies, etc. you might be experiencing. Moreover, nonrenewable petroleum is the main component used in the manufacturing of these products. Petroleum is not only responsible for putting your health at risk but also causes water and air pollution. They are also behind water pollution and air pollution. 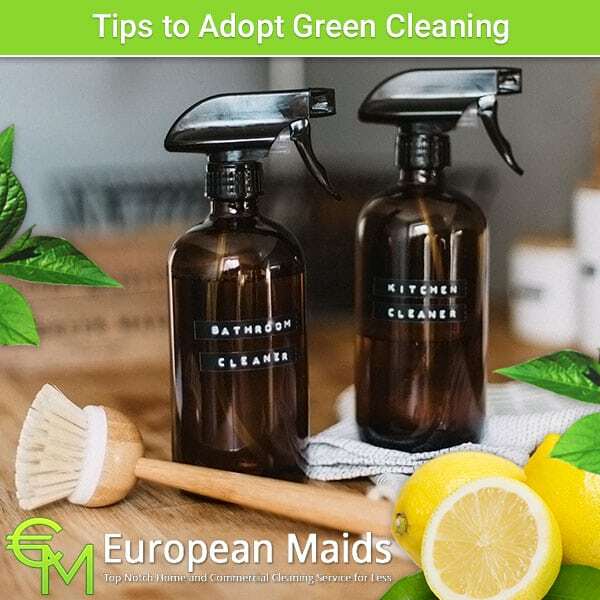 Green cleaning methods will introduce you to natural products that will keep you away from the toxic effects of chemical products. Here is a list of ways by which you can adopt the nature-friendly lifestyle. Vinegar and water solution is perfect for keeping your floors in perfect condition. Mix one cup of vinegar with one gallon of warm water. Mop your ceramic tile, wood, linoleum or vinyl floor with this solution. No need to rinse the floor afterward. If the floor has dulled outlook, mop it with straight club soda. Just apply the solution lightly instead of saturating the whole floor with it. Getting your windows and mirror spotless is a daunting task. Days of ammonia-based cleaning agent is gone. Go for the mixture of lemon juice and water. Add four tablespoon lemon juice into half a gallon of water. You can also use alcohol and witch hazel. Instead of wiping your windows with newspaper, utilize an old cotton T-shirt. Your glass decoration pieces will never be more attractive after your cleaning process. As previously mentioned, inside air is more toxic than outside. Ensure that your windows are always open to remove toxins from your house. This will also allow fresh air to enter your home. To remove the awful odor from your house, sprinkle some baking soda on the carpet and fridge. Your house won’t smell like a rotten dead body. Instead of using air freshener, boil some cinnamon, cloves or any herbs to make your home smell nice. It is not easy to make your furniture retain its look. Cleaning products tend to destroy the polishing of furniture. Furthermore, the polish is not only smelly, but it is also harmful to your health. Polish is known for being poisonous as they are made up of petroleum distillates and solvent. Salad dressing is not only good for your health but will also make your furniture stand out. Mix 2 parts of olive oil with one part of lemon juice. Dap the coffee stains on your furniture with this mixture. Remove it cloth and your furniture will surely impress your guests. 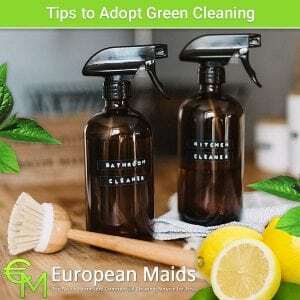 For more thorough cleaning, you can hire a reputable green home cleaning service. These professionals will not only make your home hazardous-free but will also make sure that nothing gets damaged. Your delicate glass pieces are safe in their hands.